Have you ever had the thought ‘It’s too late for me to start a business’ running through your mind? You might have even believed in it, but here are 12 good examples of why you shouldn’t have. 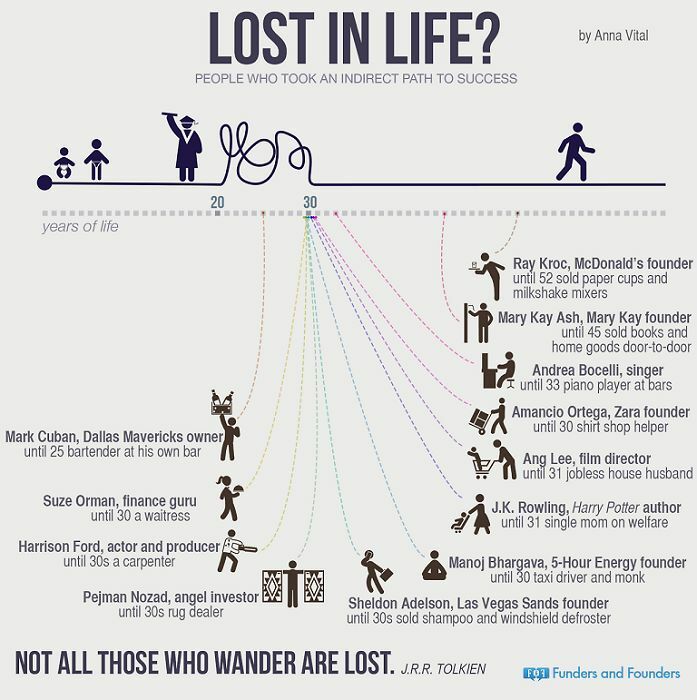 The guys and gals from fundersandfounders.com have made this cool infographic, on which you can see 12 super successful entrepreneurs, who were ‘ordinary people’ working ordinary 9-5 jobs like most of the people. And they had been doing this till their early 30. Did you know that Harrison Ford was a carpenter until he turned 30? Joanne Rowling, the author of Harry Potter lived on stated benefits before writing the book at 31, and the popular billionaire Mark Cuban worked as a barman until 25. As I mentioned in another post on this site, it’s really not important where you start and what it has been till now. What only matters is the future and what you are going to do from now on. So, if you have some big dreams, you’d better start working on them, because it’s never too late. One of the brightest examples of making billions of dollars after his 50’s is probably Ray Crock, who sold milk shakers for most of his life until he became 52… Then he started McDonalds and made it one of the most successful franchising companies not only in the USA but in the entire world. Like this post? Why don’t you share it with friends? This way you will also help us write many more stories like this. Don’t forget to check out some of our cool related topics below. Thanks for being our visitor! What Was the First Job and Career of Some Billionaires?